As a sophomore at Kenwood Academy, Ka’la Shepard faced a storm of adverse circumstances. She was pregnant, her mother had lost her job as a medical technician and their home was in foreclosure. School faded in importance. “I found myself trying to help my mom by making money, doing things I shouldn’t have been doing,” Ka’La says, careful to avoid specifics about what she did. When it was time to wake up and get to class, Ka’la was too tired, from work and from the emotional burden of everything going on in her life. She skipped school—once, twice, and then so many times she failed almost all of her classes. Suddenly, Ka’la, who had been an honor roll student in elementary school, found herself behind without a clear path for how to get back on track. “I was confused and angry,” she says. She wasn’t the only student in that predicament. Chronic truancy is the elephant in the room for Chicago Public Schools, a problem that must be solved before others can be addressed. Truancy is often interwoven with other social ills, such as homelessness, that originate outside schools but impact children in school. Last school year, 11 percent of the entire student population—41,771 students—were classified as chronic truants. These students were absent for almost a month: 18 days out of a 170-day school year. In contrast, the average truancy rate elsewhere in Illinois has remained at a stable 2 percent for the past decade. At some Chicago high schools, the numbers are staggering. For example, two-thirds of Crane High School’s students were chronically truant in the 2009-2010 school year. The statistics on truancy have soared since the district unveiled a new computerized system for recording attendance and other student information. But, faced with this more reliable information, the official response has been tepid at best. Between Sept. 14, 2009 and Nov. 23, 2009, the district’s law department held 201 truancy adjudication hearings, in which parents of truants were brought in to discuss how to get their children back in school. (The hearings were for cases from 2008.) But last year, no new hearings were held, and CEO Ron Huberman cut the attendance office and told schools to work with area offices on truancy issues. In February 2010, Huberman issued a memo formally suspending the adjudication process. Meanwhile, schools have limited resources to track down absentees. At Ada S. McKinley Academy, an alternative school, several students recall their days in regular high schools and say that they were absent for days on end without anyone calling or coming by to check on why they were gone. CPS has also lost allies in the truancy battle. More than a decade ago, truancy officers, who were usually retired police officers, were laid off. And the Cook County State’s Attorney’s office has told CPS officials that they no longer have the resources to prosecute parents of severely truant children. The work in the trenches is mostly handled by student advocates (usually hired by schools using discretionary money) and by social service agencies that have contracts with CPS for truancy work. Revin Fellows of Family Focus, which works with three elementary schools and two high schools, has seen a host of troubling situations in trying to track down students. Sometimes the family has hastily moved away, or the home is vacant and boarded up. Other times, Fellows learns a student has been locked up in a juvenile facility. Or he finds a student, but the family is in precarious circumstances. Indeed, the recession has made family and community instability the norm in some Chicago neighborhoods. On the South and West Sides, the 2008 American Community Survey pegged unemployment at a staggering 28 percent. Since then, unemployment throughout Chicago has risen to 9.9 percent from 7.2 percent, and while no updated community data is available, joblessness has likely increased as well in neighborhoods like Englewood on the South Side and Austin on the West Side. The offshoot of high unemployment is a struggle by families to keep a roof over their heads and food on the table. Home foreclosures in Chicago soared in the first quarter of this year to the highest level in any quarter during the past five years, according to the Woodstock Institute. Food pantries and soup kitchens have seen a 36 percent increase in visits from people needing groceries and meals, according to the Greater Chicago Food Depository’s 2010 report on emergency food distribution in Cook County. And this fall, CPS is serving 9,000 homeless children, more than the district has ever had so early in the school year. During the course of the year, the early figures usually double, says Pat Rivera, the now-retired director of homeless education for CPS. The recession “has just devastated families,” says Rivera. Nowhere is that more evident than at Stewart Elementary School in Uptown. For decades, Stewart has been the landing place for children from the two nearby family shelters. Last year, a third of Stewart’s students were homeless. The truancy rate of 14 percent was higher than the district average. The mobility rate was 62 percent: That means two-thirds of the students in class on Day One in September were no longer there in June. Principal Juliet Rempa doesn’t allow her teachers to use students’ lack of stability as an excuse not to try hard to teach them. But she admits it is a yeoman’s task. Everyone has to pitch in. “By the end of the day, we look like ghosts,” she says. The school has no full-time liaison or social worker to work with homeless youngsters. The assistant principal is in charge of attendance, in addition to a host of other duties. Talking to parents can be a revelation. Sometimes, parents don’t bring their children to school because they are embarrassed. Rempa is now working to get a shower and a washer and dryer in her building so she can do laundry for children and let them wash up. Over the past decade, CPS has made it easier for homeless children to stay in their school even if they move, and get vouchers for uniforms and books. But the burden of taking care of basic needs, like baths and clean clothes, should not be on the schools. For many homeless and transient families, the real answer is decent, affordable apartments, says Rene Heybach, director of the Chicago Coalition for the Homeless Law Project. Danger also contributes to truancy. Fellows says he recently was given the name of a truant boy from Marshall High School in East Garfield Park, and drove to the boy’s house only to find the whole street shut down by police. While some children are truant because of problems at home, others fall into the habit of missing school after being suspended. CPS has one of the highest suspension rates in the country. 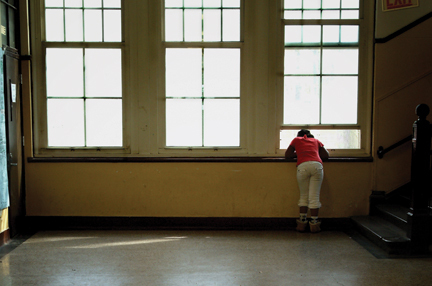 Given the startling statistics on chronic truancy, alternative schools should be part of the discussion.These schools offer a second chance that disconnected students need, says Jack Wuest, executive director of the Alternative Schools Network. Recent legislation raising the cap on charter schools allows for five alternative school networks. Wuest says CPS should waste no time making these networks a reality. The current network of 22 alternative schools, called Youth Connection Charter Schools, has scarce resources for the job. Only about 20 percent of students graduate. But for Ka’La, the Ada S. McKinley school has been a savior. Even while she was homeless, living in cars or sleeping on couches, she felt comfortable there and excelled. Her life is getting better. Four months ago, Ka’La, her 3-year-old son and her mother moved into an apartment. Ka’La is earning straight A’s and running for president of the student council. On the door of the school is a color poster with her picture. Her speech teacher, Veronica Blake, tells Ka’La how proud she should be of her “professional” poster and that, if the candidates have a chance to give a speech, she’s got it made. Amid protests over slashed school budgets, CPS announced plans on Wednesday to open new schools for current and potential dropouts. The film projects are about issues that are personal to them, and producing the films gives students a chance to talk about the issues as they write a screenplay, shoot the film, edit it and present it to the public.